Sorry for the crappy pictures. Sometimes recipes happen at the end of a long day. This is what it looks like out of the oven. See my art twine? He saw somewhere online this idea of the pinwheel loin situation. After a noisy rummage through our pantry and fridge (he can’t find anything in there since it’s my disorganization skills that put things away), he finds some red onion, some sundried tomatoes, arugula that was about a day away from turning black and a log of goat cheese. 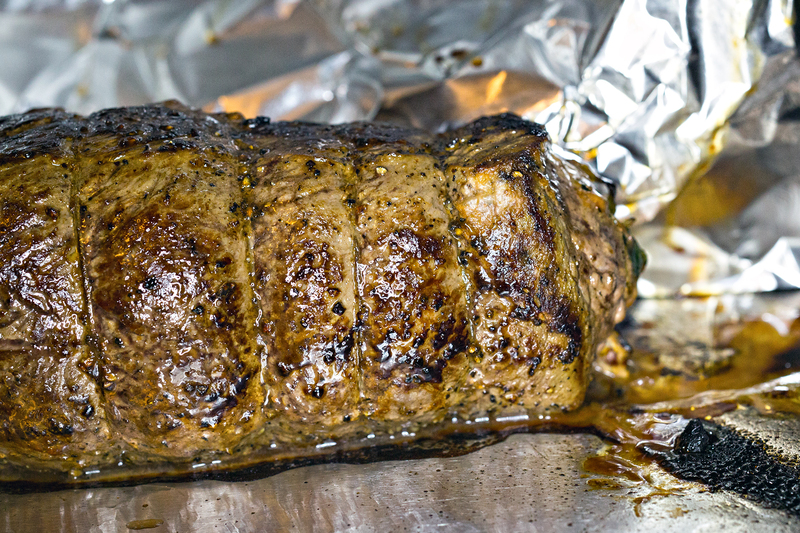 The hardest part of this whole recipe will be slicing the tenderloin/backstrap right. The biggest tip I can give is to use a really sharp knife. After that, simply spread whatever fixin’s you want inside, roll it up and secure it shut with toothpicks or baker’s twine. I’m not gonna lie – I used arts ‘n crafts twine from Hobby Lobby. Completely frowned upon and probably illegal in a restaurant setting, but we did not get sick and die. Use at your own discretion, though. When it comes to the filling, you can be as creative as you want. This recipe is great for your first time or for something tried and true, but you can fill it with anything. Apples and cheese, fruit chutney and mint, caramelized onions and bacon… really the possibilities are endless. Preheat oven to 400 F. Heat a skillet over medium-high heat and add the olive oil. Add the onion and sundried tomatoes and sauté until the onion is caramelized, about 7-10 minutes. 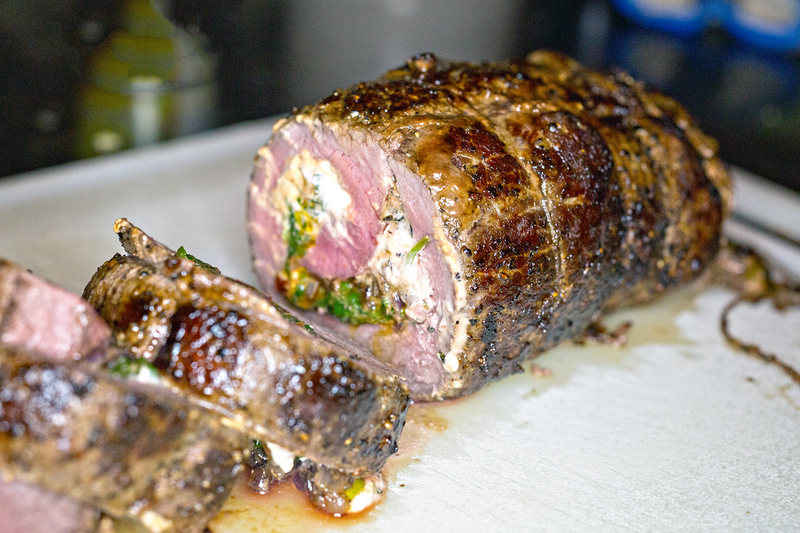 Meanwhile, with a very sharp knife, filet out the tenderloin longways in a spiral, gently rotating the backstrap as you cut it and allowing it to "unroll." Make sure the meat stays about 1/4-1/2 inch thick. You end up with a nice flat piece of back strap. Spread the goat cheese onto the backstrap, followed by the onion and sundried tomato mixture and some salt and pepper to taste. 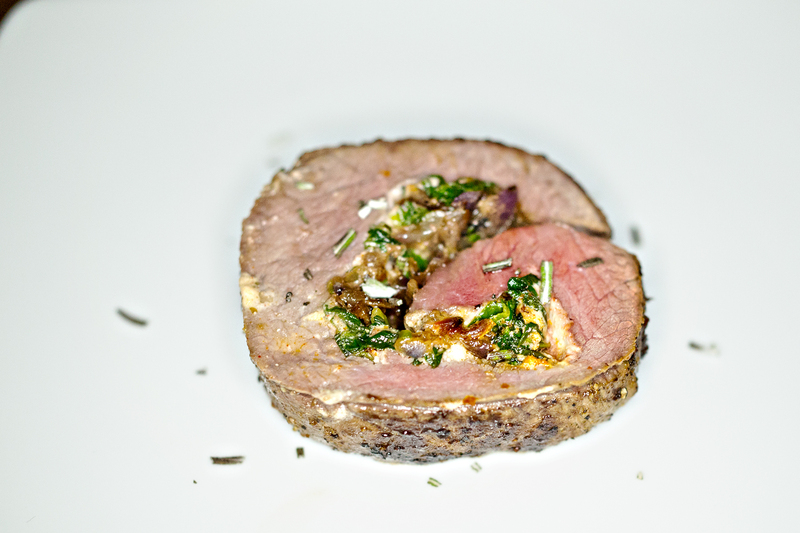 Then roll the backstrap into a pinwheel and secure with baker's twine or toothpicks. On a foil lined pan or baking dish, bake until the internal temperature is 130, or about 15-20 minutes. Let rest covered for about 5 minutes then slice and serve. Non-game substitution: Either a pork loin or beef tenderloin would be great – if using a pork loin make sure to cook it all the way through.